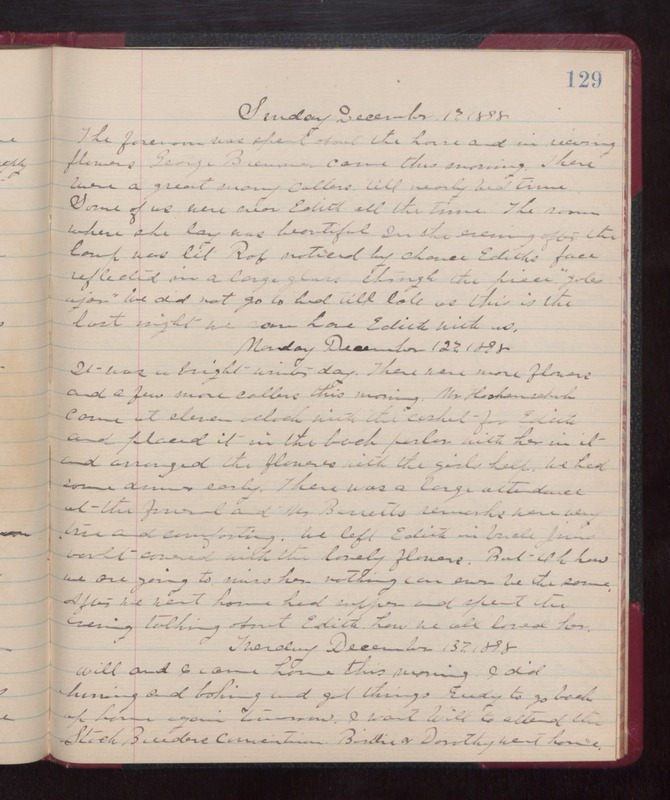 Sunday December 11th 1898 The forenoon was spent about the house and in receiving flowers. George Bremmer came this morning. There were a great many callers till nearly bed-time. Some of us were near Edith all the time. The room where she lay was beautiful. In the evening after the lamp was lit Rob noticed by chance Ediths face reflected in a large glass through the piece "gates ajar." We did not go to bed till late as this is the last night we can have Edith with us. Monday December 12th 1898 It was a bright wintry day. There were more flowers and a few more callers this morning. Mr Hoschensbach came at eleven oclock with the casket for Edith and placed it in the back parlor with her in it and arranged the flowers with the girls help. We had some dinner early. There was a large attendance at the funeral and Mr Barretts remarks were very true and comforting. We left Edith in Uncle Jims velvet covered with the lovely flowers. But Oh how we are going to miss her. Nothing can ever be the same. After we went home had supper and spent the evening talking about Edith. How we all loved her. Tuesday December 13th 1898 Will and I came home this evening. I did churning and baking and got things ready to go back up home again tomorrow. I want Will to attend the Stock Breeders Convention. Birdie & Dorothy went home.